The World Rugby judicial panel have reached a verdict on Israel Folau, after the Wallabies fullback was cited for dangerous play in the third test against Ireland on Saturday. Folau was suspended for one match at a judiciary hearing in Sydney. In the ninth minutes of the Wallabies’ loss, Folau appeared to reach under Peter O’Mahony’s arm while the two were competing for the ball in midair, tipping the Irishman back to the point where he appeared to land on his shoulder or neck. 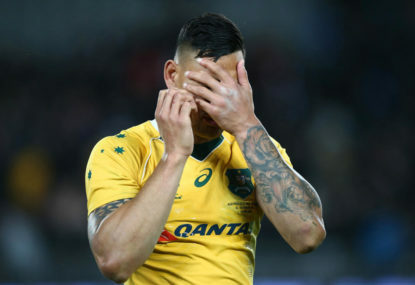 While Folau wasn’t yellow carded – or even penalised – for that incident, a remarkably similar incident later in the game saw him sent to the sin bin. Michael O’Leary, the citing commissioner, deemed a sin bin for that incident sufficient, but elected to charge Folau with dangerous play for the previous one, despite neither the on-field referee nor the Television Match Official calling it. While the referee deemed Folau to be reasonably contesting the ball, Law 9.17 reads; “A player must not tackle, charge, pull, push or grasp an opponent whose feet are off the ground” – which is clearly what Folau did and, subsequently, what the hearing was always going to revolve around. Fans were unhappy with initial charge, however, claiming it was, in fact, O’Mahony’s teammate who put him in danger by lifting him off the ground. Many were of the opinion that whatever decision was reached would have wide-reaching implications of aerial contests in Rugby going forward. The charge put a bitter aftertaste in the mouths of Wallabies fans who, despite the 2-1 series loss, would have been pleased with the competitiveness Australia showed against the current world no. 2.